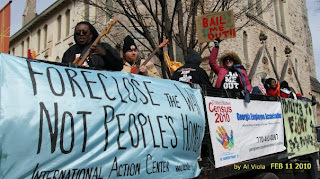 30th Anniversary of Poor Peoples Day in Atlanta GA. February 10-11 2010. 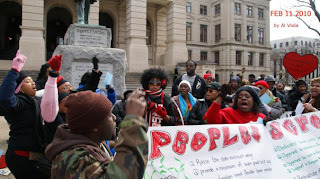 The 30th Anniversary of Poor Peoples Day was successfully celebrated on February 10-11, 2010 in Atlanta GA. The events leading up to this day were put together by the Georgia Citizens' Coalition on Hunger and various local and national grass roots organizations including Project South( http://www.projectsouth.org), Georgia Peace and Justice Coalition(http://georgiapeace.org), Grady Coalition(404.378.5883), International Action Center, and American Friends Service Committee(www.afsc.org). This year's actions have been organized to the backdrop of the most economically devastating year in decades. High unemployment leading to rising rate of foreclosure, debt delinquency, recidivism, increased war spending, loss of health insurance and cuts in public means of transportation just to name a few. With these challenges, organizing this year's anniversary was quite challenging and yet one of the most exciting Poor Peoples Day action in recent years. Months before the Poor Peoples Day, members of the community, together with other local groups had met in a series of meetings to discuss and outline the agenda on which this year's anniversary will seek to adopt and present to the Georgia Assembly. These issues were debated in small break out sessions at the day of education with panel guest experts on February 10. After the sessions, each group came out with its resolution which was put together along with other session topics. A final scroll was put together containing the main resolution which was then taken to the State Assembly on February 11. We were giving an opportunity for our key issues listed above to be presented in front of a committee, real life testimonies were also heard from Georgians who have been victimized during these economic downturns. In most cases, the law has been stacked against working people in favor of powerful corporations. We hope these legislators will work with their colleagues in addressing some of laws and policies that often support the growing cancer of poverty in our state. 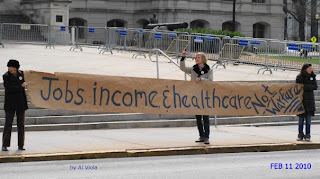 On February 11, 2010., a caravan carrying hundreds of enthusiastic Georgians from around the state began a Selma-like bus ride to the State Capitol where they were greeted with a larger banner that read, "Jobs, Income, Healthcare, not Warfare", which was painted by AFSC intern Haley Murphy. During the spirited press conference on the steps of the capitol, AFSC/Atlanta was invited to address the crowd. We used our few minutes on the mic to highlight the connections between racism, poverty, and Militarism. It is our belief that every dollar spent on these wars is a robbery from our community. Each child recruited to fight these wars is a child we need here, in Georgia, to help fight poverty. Never has there been a moment in our lifetime that we needed our your people to serve their country by serving their broken communities...right here! 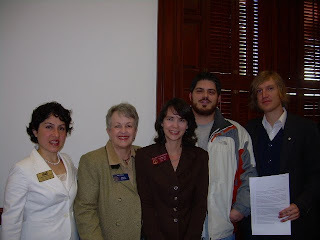 We took a moment to let folks know that there was a resolution( on the floor of the Georgia House(HR1219) and Senate(SR955) that would provide safeguards against the recruitment of children under 17 years old. Folks in the crowd were asked to pick up their phones and call their representatives and encourage them to Support the resolutions. To find out who represents you in the house and senate got to: http://www.votesmart.org . The fight to stop hunger, foreclosure, provide decent wages and health care for all Georgians and working people cannot be seen as a one day event. As much as the this anniversary was successful in carrying the message right up to the State Capitol, the fight must continue in each and every one of us. All of us at American Friends Service Committee would like to give a special thanks to Dr. Sandra Robertson with the Georgia Citizens' Coalition on Hunger. Dr. Robertson has been a tireless advocate for the poor, working class, and the disadvantaged for decades. She has been the driving force behind not only Poor Peoples day campaigns but the Hunger Coalition. 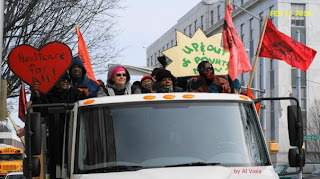 This year's actions not only marked the 30th year anniversary of Poor Peoples Day in Georgia but also marked the last year that Dr. Robertson will be with the Hunger Coalition. Our thoughts, prayers, and gratitude are with her as she makes this transition in her life. We need your help to protect Georgia's children against abusive military recruitment. What Does the Resolution Accomplish? Why is this Resolution Necessary? increased pressure on military recruiters to fill the ranks of the armed services. misconduct and abuse by recruiters, in contravention of the Optional Protocol. must continue to lead by example. including Georgia, to comply with the Optional Protocol. 1.) To support this resolution call your Representative and urge them to support HR 1219, if they are a Georgia Representative, and SR955 if they are your Senator. To find out who your Representatives are in the house and senate are go to the VoteSmart website -http://www.votesmart.org/ - in the upper left-hand corner there is a field where you- can enter your 5-digit zip code. My name is (your name) and I am writing this letter to ask for your vote in favor of HR1219/SR955. I am a concerned (student/mother/veteran/community member) who supports this resolution against the recruitment of youth under the age of 17 for the military and think that safeguards should be implemented for the recruitment of 17-year-olds. During wartime there is increased pressure for military recruiters to recruit our youth. This pressure can lead to abusive military recruitment that is in violation of the Optional Protocol to the Convention on the Rights of the Child. The United States serves as role model for democracy and human rights throughout the world, and has participated in programs abroad that prevent the recruitment of child soldiers. America and Georgia must lead by example and this is why I encourage you to support HR1219/SR955. 3.) Meet with your senator or congressman. To do so all you have to do is call their office and ask to set up and appointment. For the most effective meeting we recommend taking some one from the affected community to meet with your representative. This could include someone under the age of 17 who has been targeted by military recruiters, a parent concerned about their child’s safety and privacy, a veteran who has experienced the effects of war. The only way this Resolution will make an impact is with your help. Please contact me if you have the time and energy to devote to organizing in your community. AFSC/ACLU Press Conference Introducing Resolution Designed to Protect Minors From Deceptive Military Recruitment Practices. On Thursday January 28th The American Friends Service Committee and The American Civil Liberties Union of Georgia held a joint press conference at the State Capitol to mark the introduction of a resolution that would protect children under 17 from direct contact from military recruiters. The Resolution is the culmination of months of work that began when Azadeh Shahshahani of the ACLU offered to work with AFSC during our campaign to halt the Dekalb Marine Corps Institute project, which would have been a publicly funded Marine Corps themed School run by the Marines and funded by recruitment dollars. After the successful campaign we began looking at the state of military recruitment in Georgia and came to some troubling conclusions. Our concerns continue to grow over the racial and economic inequities in military recruitments.Low income recruits continue to fill the majority of boots on the front line, many will also end up filling up homeless shelters as a results of the wounds of war(1/3 of homeless people are veterans).More troubling is the continued reports of deceptive military recruitment practices used on children,often times under 17 years old, in our public school system. Every year the army experience convoys rolls through middle schools all over Georgia, and the rest of the country, to demonstrate how exciting and fun war can be. In their army recruitment pitches combat is relegated to nothing more then a video game. In our high schools military recruiters enjoy as much access to students as they want, often times parading themselves as career counselors who are only there to help young people with their futures. The recruitment pitch that kids are given often includes promises of college cash, jobs skills training, top notch lifetime benefits, seeing the world, and some kids are even told they will likely not see combat. What young people are getting from military service is usually very different then the picture painted by recruiters. Veterans make 15% less then their non-veteran counter parts, 1/3 of female vets report being sexually assaulted while on duty, only 1/5 of vets every get a four year degree, modern veterans have the highest suicide rate in recorded history, and the enlistment contract binds you but not the military-they can breach the contract as they please. So this is at the core of our support of the resolution. Children under 17 should have no direct contact with recruiters or military recruitment tools including the Armed Services Vocational Aptitude Battery(ASVAB) and the army experience. Recruiters should not have access to minors, especially without parental consent. Under the "no child left behind" act high schools must release private contact information of all 11th and 12th grade students or face losing their federal funding, this is a pretty scary concept. Often times parents and students are unaware that they have the option to protect their information from falling into the hands of recruiters. This resolution urges school districts to step up their efforts to provide every parent with a form that would enable them to remove their child's info from the hands of military recruiters." We believe that students, parents, and teachers have the right to have a realistic picture of what military service and military benefits actually looks like before on the front end of the recruitment process. Chris Raissi, an Iraq war veteran and former Marine Corps recruiter, spoke at the press conference stating, "I think the resolution is very reasonable. Recruiters are trained to work everyone in a high school, from freshmen to seniors. From my experience, the schools don't give any notification to the parents about dissemination of student's personal information to recruiters. If Parents ignore their phone calls, recruiters are trained to track down every kid on the list, either at school or at home." Azadeh Shahshahani of the ACLU and the sponsors of the resolution in both the Georgia House(Rep. Stephanie Stuckey Benfield) and the Georgia Senate( Senator Nan Orrock) all spoke in support of the resolution at the press conference. The resolution was assigned a number in the Georgia House(HR 1219) and the Georgia Senate (SR 955), and you can expect a lot of organizing around the state on this important resolution. To support the resolution call your Representative and urge him to support HR 1219, if he's a Georgia Representative and SR955 if they are your Senator. To find out who your Representatives are in the house and senate are go to the VoteSmart website - http://www.votesmart.org/ - in the upper left-hand corner there is a field where you can enter your 5-digit zip code.